What a price tag, am I right? But does it work? Does it deliver? Here is what I thought playing dermatologist. With some new skincare additions to my routine my skin is experiencing prolonged clarity, zero breakouts, less shine, overall health, except that I have scars and hyper-pigmentation that plague me now. I was on the hunt for a product to diminish these spots. But I was also looking for a retinol product and a product that contained Hyluronic Acid too. A tall order, but even still it had to be free of as much toxic gunk as it could be. 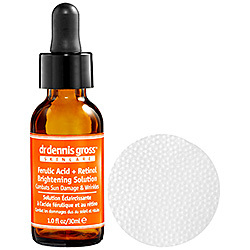 After an extensive product search I settled on Dr. Dennis Gross Ferulic Acid + Retinol Brightening Solution. Not only does it have retinol, but it has hyluronic acid in it too, and is free from Parabens, Sulfates, Synthetic Fragrances, Synthetic Dyes, Petrochemicals, Phthalates, GMOs and Triclosan. I’ve been using it consistently for about ten days, both AM & PM and so far I am pleasantly surprised by the results. + My acne scars are less red and noticeable, I’m even convinced some of them are gone! Basically, this stuff totally works. I’ve only been using it for ten days so I can imagine that over time the results will be even better, so check back as I’ll update in about a month. The price tag may be high, but I skipped a trip to the Doctor’s office and co-pays for both a Doctor’s visit and a prescription retinol product. Basically a win-win.